OK, just made a radio account. I'll mainly be a fill-in, but I'll sometimes do a real scheduled show. I'll mainly be playing whatever the hell is on my playlist, plus random rantings. Here's the poster he wanted for his show. APX, I really appreciate the poster. Thanks, man. Wow. You're missing some words there. Wow. You're missing some humor there. Cleverly ribbing other members is great, innit? I love watching these threads. You see, it's times like these that I highly regret not having a :kyon: smiley. It's just so...appropriate. Yes, Dori. You're missing a great deal of humor. And for your information, if anything I had added words. If you remove the 'can' from my phrase and say it, it's perfectly understandable and should retain comedic value even to an internet peon such as yourself. This thread is now over nine thousand. It demands 9000 Cat. 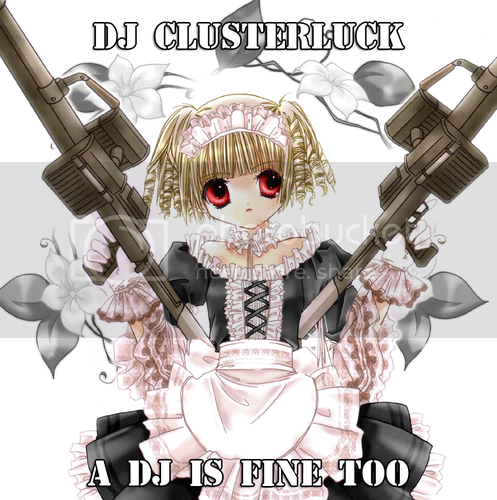 The first idea of the name was infact DJ Clusterf**k.
Besides, the music's kind of a lucky dip, hence the Luck. Oh, and I could make pics from that doujin, but I'm too lazy. QFT. I did say Clusterf**k to begin with but we both figured it'd be better off as a work-safe name. Plus it kinda gives it a certain roll to it that flows better. Or something. Whatever. It was better than the other crap names I thought of for him. Okay all, seeing as there's no school tomorrow, I'll be doing a show at 8pm PST. It'll just be random crap to fill time. Drop in to the chat if you're bored and have some fun. /r/ sendspace link to PSB remix of Mein Teil. Also, how do I maek'd epic rekwezts? ¯\(°_o)/¯ SoaD, Taaapu Gaanzu, Final Countdown, etc. You win as a DJ. If you want any songs from tonight's show, post em here and I'll get them uploaded. I just want to say, I listened to this show both at work on my phone and when I got home. Amazing show, simply amazing. Top Gun + FF7 + SoaD = EPIC WIN. 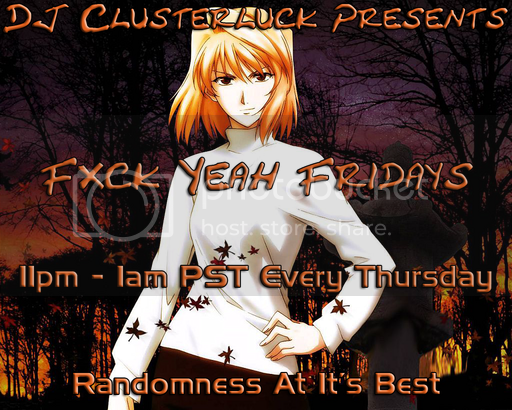 Judging by the reaction though, I may have to make F*ck Yeah Fridays a regular thing. For DJ Clusterlucks new schedule! If it's going to be something official to use for advertisement, I'd suggest correcting the "it's" to "its" first though. Unless of course..you're wanting it to read, "Randomness At It Is Best".